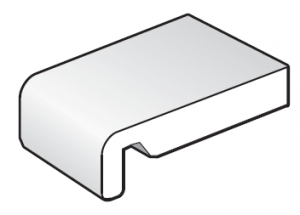 FloPlast 250mm White Replacement Fascia Board - 2.5m length. These FloPlast fascia boards are designed to be fitted direct to the rafter ends and, due to thier rigid linear strength, do not require a backing board. This makes them suitable for total replacement and new build applications. These FloPlast plastic fascia boards are 18mm thick with a 35mm leg. All sizes are External measurements. These boards are also available in woodgrain effects of Rosewood, Golden Oak and Black Ash. Please see our other fascia and soffit sections for these colours.